Do You Know The History Of Long Bridal Trains And What The Length Signifies?Do You Know The History Of Long Bridal Trains And What The Length Signifies? Do You Know The History Of Long Bridal Trains And What The Length Signifies? Home > Blog > CULTURE & ENTERTAINMENT > Trending > Do You Know The History Behind Long Bridal Trains And What The Length Signifies? Do You Know The History Behind Long Bridal Trains And What The Length Signifies? Priyanka Chopra and Nick Jonas’ wedding pictures look absolutely dreamy. We’ve all done our fair share of swooning over them by now. Apart from the grandeur of this wedding and Sansa Stark’s gorgeous desi looks, another feature stood out. If you got a close look at the pictures, you would notice that the train of Priyanka Chopra’s wedding dress for the white wedding was really, really, long. Perfectly highlighting a custom-made Ralph Lauren gown, the train seemed to carry on for miles across Umaid Bhawan. We’ve seen such long trains on bridal gowns mostly in royal weddings in Europe. In May this year, we saw the Duchess of Sussex, and Priyanka Chopra’s friend, Meghan Markle manage a 16-foot long veil on her wedding day. You might think that’s really long, right? Well, Priyanka Chopra seems to have taken a cue from that and gone a few steps further. Her veil was 75 feet long! It needed five people to carry it for her as she walked down the aisle. While this may be more of a fashion statement now, the bridal veil and train have an interesting history behind them. According to wedding historian Susan Waggoner, brides were “wrapped from head to toe to represent the delivery of a modest and untouched maiden.” It is also believed that the Romans used bridal veils as a way to keep evil spirits away. Apparently, these veils would have prints of fire on them for this purpose. But this show of “virginity” or act of warding off evil doesn’t explain the concept of a long piece of cloth trailing behind the bride. More than a fashion statement, or a tradition with a deep meaning, the bridal train was meant purely as a way to show off wealth. Since ancient times, wedding dresses have been used, in many cultures, as a display of money. People started using the quality and quantity of fabric to tell the world about their riches. The longer the train, the more money the bride’s father had. Queen Victoria was the first royal bride to have her train carried while she walked down the aisle. From Diana to Kate and now Meghan, this trend continues till today in the royal family of England. 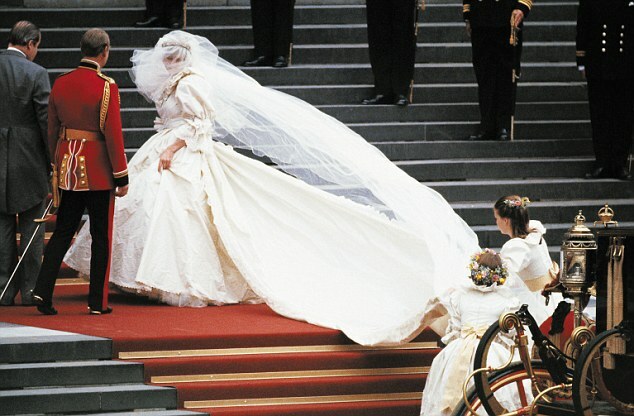 For a long time, Lady Diana held the record for the longest train worn by a bride. Hers was about 25 feet long, and the dress remains the gold standard for white wedding dresses. We don’t know why Priyanka Chopra chose to wear a 75-foot long veil, but it did look pretty amazing. The stunning visuals almost make up for the fact that it must’ve been really difficult to manoeuvre. What did you think of PC’s royal moment?